The pause between planes in San Francisco was more a lesson in art rather than a time to make art. Visits to galleries and museums are the art history classes that I never attended. Not because I skipped! I had no idea how much I would wish I had signed up for those classes. Now I make up for those missed lessons by strolling though galleries and museums, seeing some of the great works up close. I've been awed and inspired and surprised. If there's a pop quiz or test then I don't feel well and I'll have to miss the rest of the class. In San Francisco I had time for a few stops. I started with the Cartoon Art Museum, hit the Museum of Modern Art and did a bit of shopping at Flax. The 70 Years of Archie Comics exhibit at the Cartoon Art Museum was fun and funny. Seventy years of stories and art is amazing. At MoMA, paintings by Frida Kahlo, Diego Rivera and Henri Matisse made the strongest impression. The colors of the painting by Mattise delighted me. Rivera too. Beautiful shapes and layers of colors. Wondering... as I stand near an interesting piece in a bright gallery I'm responding to the piece in front of me while the other work of that artist that I've seen hovers close in my memory. Would I respond the same to the one if I hadn't already seen the others? Inspired by Frida and those other guys I headed for Flax. This is a fantastic art supply store and I went in at the most dangerous time. Inspired and energized to make art is not the best time for me to step into so much color and possibility. It's like shopping for groceries when you're hungry. Bad idea. Thankfully I was able to find some restraint by reminding myself how much my luggage already weighed. I escaped with just a few color brushes. There was time to sit down, enjoy dinner and try out the new brushes before heading back to the airport. Next stop, Atlanta. What I realize days later when I'm adding color to my journal is that Archie and Frida have something fabulous in common. 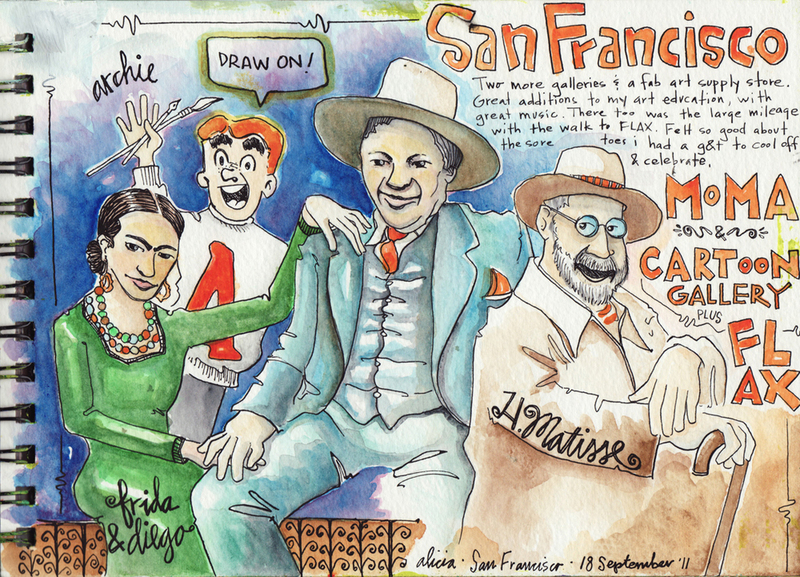 They're both drawn, in Frida's case by her own hand, with a significant, iconic eyebrow/s. Put that on the quiz!